This is a building with challenges! Built spanning a central city road in Palmerston North (NZ), it cantilevers out at 10m and has semi-circular end sections . . . 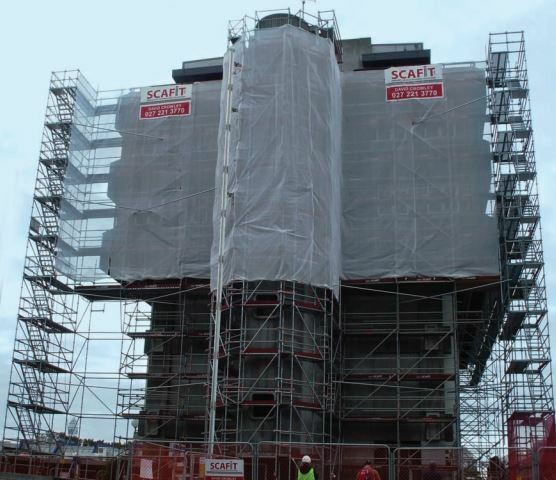 Furthermore, the job had to be done in eight stages with each stage having a seven day turnaround period: “The timing of this job was crucial, and the way that the Scafit team worked around the weather, daylight problems, road closures etc is a real credit to their business,” says David Chapple from Chapple Consulting. Strong partnerships are essential for our business,” says David Crowley, Managing Director for Scafit. They wish to thank Camelspace for their assistance with the gear requirements and to Layher for design input and the hire of a GEDA 300Z goods hoist.